Downbelow had the privilege of celebrating World Environment Day 2014 with enthusiastic students from the Faculty of Hotel & Tourism Management, Universiti Teknologi MARA (UiTM). The fun-filled day with the serious message of conservation was held at Downbelow’s PADI 5 Star IDC Dive Centre, Gaya Island, Borneo. The day was structured into three key sessions so after a welcome from DB MD Richard we embarked on a Beach Clean-up, Ocean Snorkel Session & Coral Education Presentation. 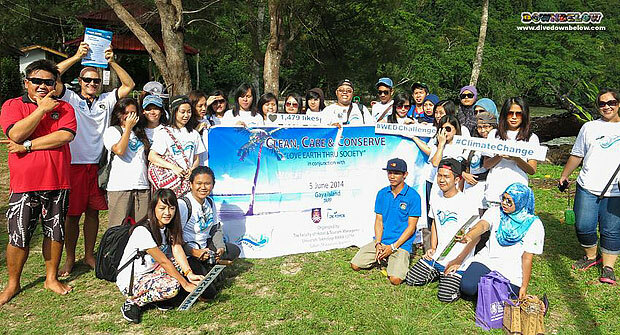 Together with the Downbelow island crew we joined forces & cleaned the beaches to really make a difference directly. Later on Downbelow team took all participants on a snorkel session to see & also clean the coral reef so that they could appreciate the beauty of their local environment of Sabah. Lastly the Downbelow team presented the AWARE Coral Reef Conservation Presentation to the fun-loving group where the importance of reefs to the ocean and our planet were discussed. We used the Project AWARE (a non profit foundation) platform to raise awareness to many of the challenges our ocean faces as clearly education is the way forward & who better to share it with than the young students such as this group. We also donated a total sum of RM1,500 to Project AWARE in conjunction with World Environment Day and as part of the program too. We wish to highlight that we love their concept of using social media to spread the educational message to the world & we can’t wait to support this group again. Special thanks to Irfan (ex DB staff) for helping bring this program together!